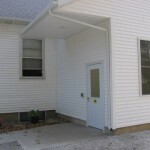 Mobility accessibility means that anyone can use the congregational building and grounds. 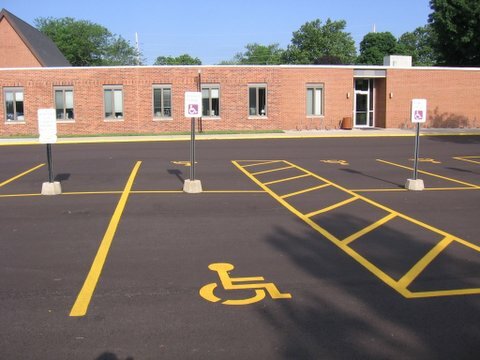 This means the congregation provides accessible parking leading to an accessible entrance, which, in turn, leads to an accessible worship area and preferably to at least one accessible classroom. Accessibility for wheelchair users has become the criteria of measurement for many areas of mobility accessibility. Also included in this section are questions related to hand mobility, particularly in the use of door handles and water faucets. Congregations that earn the Mobility emblem meet the criteria outlined for Parking, Entrance, Interior, Restrooms, and Worship Area. Congregations are highly encouraged to meet the criteria for Classrooms and Social/Gathering Area as well. 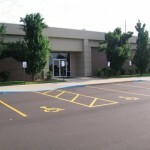 Parking: Accessible parking spaces are provided. 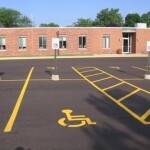 All accessible parking spaces have common features. Note the slight differences between Van Accessible spaces and Car Accessible spaces. ____ Each parking space has a level, stable surface. 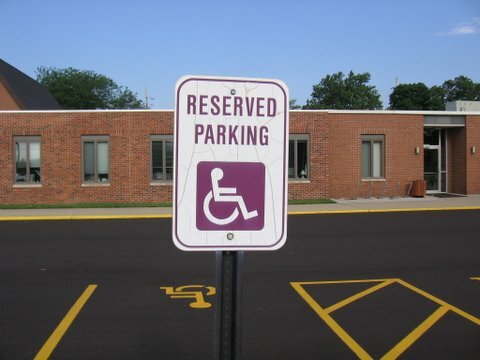 ____ Parking spaces are marked with an upright sign with the universal accessibility symbol clearly visible even when a vehicle is parked in the space. 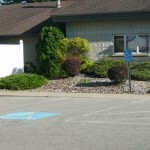 ____ Accessible parking spaces are at least 8 feet wide. 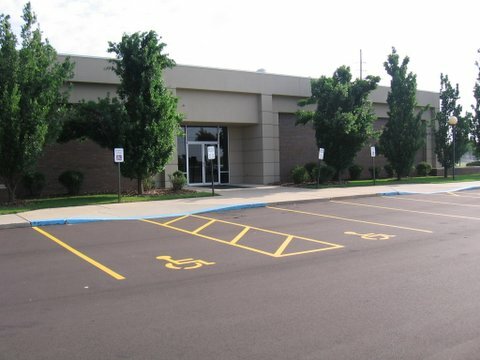 ____ A path at least 36 inches wide leads from the parking space aisle to an accessible entrance. Path is level or at a grade of no more than 1:12 (for 1 in. of rise, 12 in. of length). 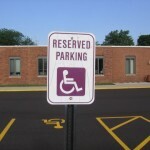 ____ A sign reading “Van Accessible” is alongside the universal accessibility sign. The number of accessible parking spaces needed is based on the total number of spaces. 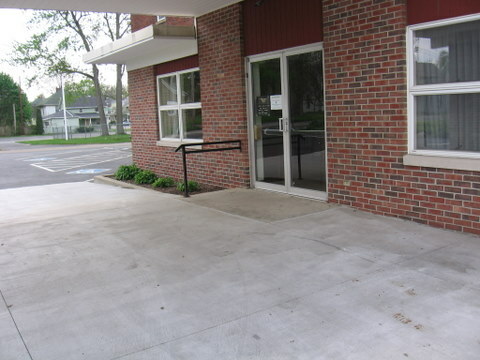 Entrance to the building is accessible to people who use wheelchairs, scooters, and walkers, as well as others who have difficulty using stairs. Note: This question only pertains to the method of building entry. A later question will address accessibility within the building. ____ Accessible from accessible parking spaces via a smooth path at least 36 inches wide at a grade of no more than 1:12 (for 1 in. of rise, 12 in. of length). ____ There is at least a 5 foot level platform at the entry door. 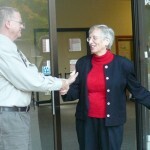 ____ The doorway entrance into the building is at least 36 inches wide. ____ Doorway has a level threshold of no more than ½ inch. 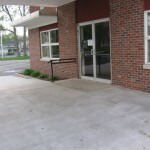 Accessibility can be via Ground level, a Ramp, or an Elevator or lift. ____ Ramp maximum incline of 1:12 (for 1 in. of rise, 12 in. of length), preferably 1:20. ____ Ramp minimum width is 36 inches. ____ Handrails are provided–on at least one side for shorter ramps (except curb ramps) and on both sides for rises of more than 6 inches. ____ After each 30 feet of ramp (measured horizontally) at a slope of 1:12 to 1:16 (or 40 feet for a slope of 1:16 to 1:20), there is a level landing. ____ Elevator or lift is certified by the company for intended use. 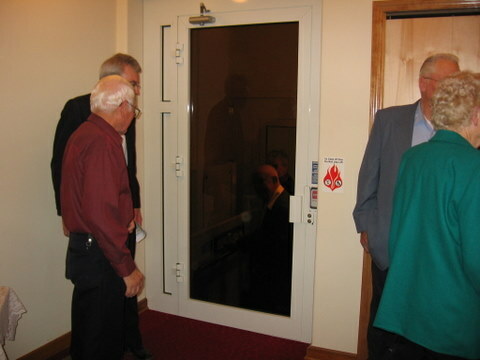 ____ Elevator or lift is able to be easily used by standing or wheelchair user. 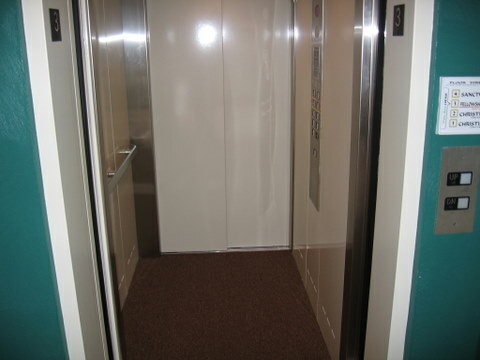 ____ Elevator or lift is large enough to accommodate a wheelchair (preferably, along with a standing attendant). ____ Elevator or lift is able to bear the weight of a power wheelchair with person in it. 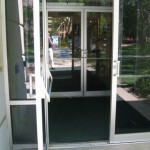 Automatic doors are recommended wherever possible since they provide the greatest amount of independence to the most people. 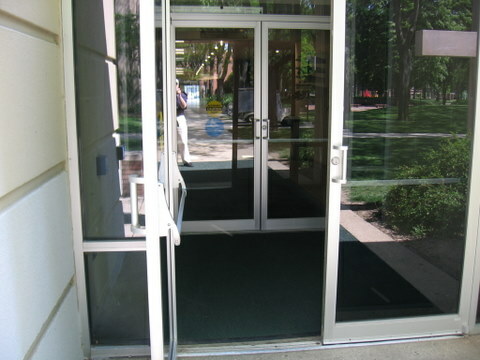 Manual doors can also be made more accessible. ____ Able to be opened by a wheelchair user without forcing the wheelchair off of the surrounding level surface. ____ Have a handle easy to grasp with one hand without the need for tight grasping, pinching, or twisting wrist. ____ Doors are light and easy to open (less than 5 lbs. pressure) by a wheelchair user. 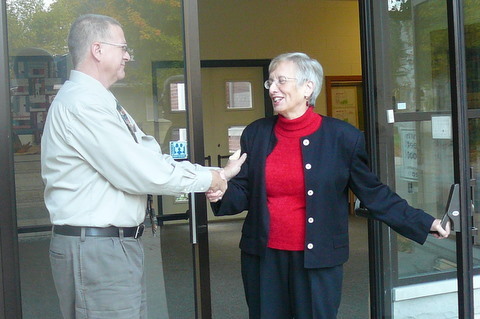 ____ (Highly recommended) Have an usher or greeter stationed at the door to help persons with mobility challenges. 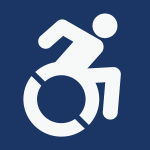 ____ Marked with the universal wheelchair access symbol and in good operating condition. ____ Plainly visible push buttons at comfortable height for person in a wheelchair. ____ Buttons at sufficient distance from any door that opens toward the user. ____ Doors open at moderate speed and give sufficient time for user to pass through. Interior. Hallways and other interior sections of the building are accessible to people who use wheelchairs, scooters, and walkers, as well as others who have difficulty walking. Note: All of the criteria are required unless otherwise indicated. ____ Hallways. 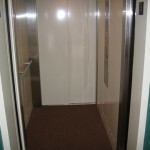 Hallways are level or have an incline of no more than 1:12, have a barrier-free width of at least 48 inches (60 inches preferable) to allow one wheelchair and one person walking to pass each other. ____ Coat Racks. At least one section of coat racks is low enough to be accessible by persons in wheelchairs and small children. ____ Carpets and rugs. Carpets and rugs are securely attached with a firm backing and have a pile level no more than 1/2-inch thick. ____ Door handles. 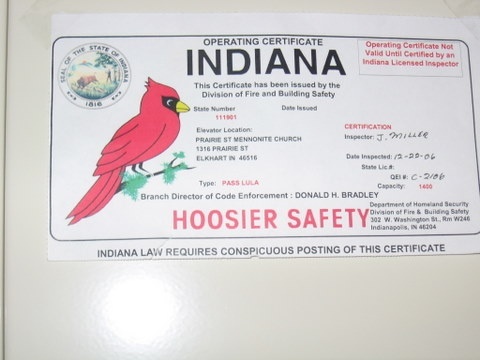 (Required for doors on restrooms, worship area, and classrooms labeled accessible and highly recommended for others.) Room doors are able to be opened and closed with minimum effort and have handles that do not require tight grasping, pinching, or twisting wrist (generally lever handles). Family/companion restroom. At least one is highly recommended. This makes it possible for a spouse or attendant of a different gender to assist the person with the disability. Restroom stall within the standard facilities for each gender. Accessible family/companion restrooms meet the following criteria. 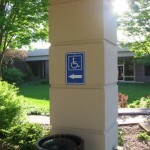 ____ Have signs clearly marking them as accessible. ____ Have entrance doors with lever door handles that do not require tight grasping, pinching, or twisting wrist to operate. ____ Have entrance doors at least 32-inches wide. ____ Restrooms are at least 60 inches wide (beyond the radius of the door; see previous point) and 59 inches deep. ____ Wall-mounted grab bars are 33-36 inches high next to and at the back of the commode. ____ The toilet seat is 17-19 inches high. ____ The sink counter is no more than 34 inches high, has a knee clearance of at least 27 inches high, 30 inches wide and 19 inches deep, and hot and cold handles that do not require tight grasping, pinching, or twisting wrist to operate. Restroom accessibility provided by a stall within the standard facilities for each gender meets the following criteria. Note: Accessible stalls in standard restrooms are recommended even if an accessible family/companion restroom is also provided. 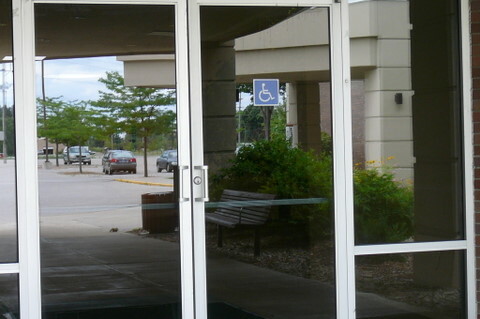 In situations where accessible stalls are the only accessible options, entrance doors to the restrooms must be wheelchair accessible (highly recommended in any case). ____ Entrance doors into the restrooms are at least 32 inches wide. 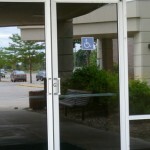 ____ Entrance doors are operable by a person in a wheelchair and any door handles provided do not require tight grasping, pinching, or twisting wrist to operate. ____ The restrooms have at least a 5 foot wide turning radius (beyond the radius of the door; see previous point). ____ At least one sink is provided with a counter no more than 34 inches high, a knee clearance of at least 27 inches high, 30 inches wide and 19 inches deep, and hot and cold handles that do not require tight grasping, pinching, or twisting wrist to operate. 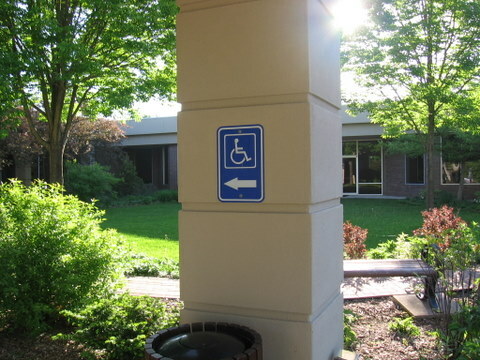 ____ Accessible restroom stalls are clearly marked with the universal accessible sign. ____ Entrance doors into the accessible stalls swing into the room, not into the stall. 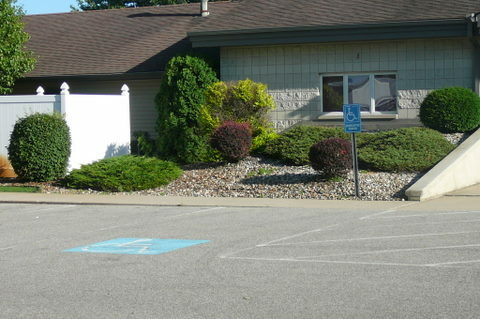 ____ Accessible restroom stalls are at least 60 inches wide and 59 inches deep. 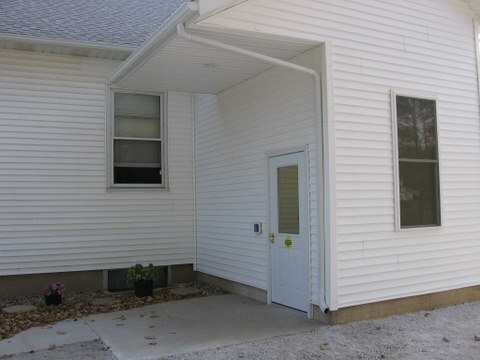 ____ Accessible stalls have secure, wall-mounted grab bars 33-36 inches high on the side and at the back of the commode. ____ Accessible stalls have a toilet seat 17-19 inches high. ____ Have an accessible building entrance and hallway leading to them. 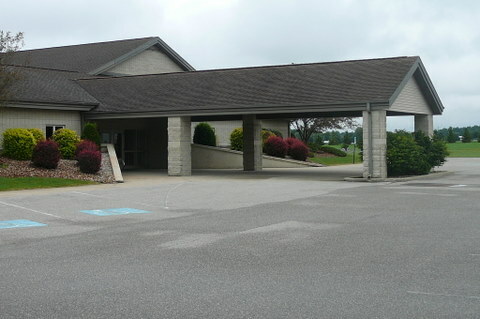 ____ At the entrance, the presence of greeters, a clear view, and/or clear signage indicates the way to the accessible entrance to the worship area. 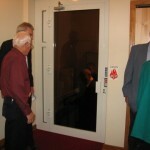 ____ The doorway entrance into the worship area is at least 36 inches wide. ____ Ushers are available at the doorway to help persons find seating. Accessibility can be via Floor level, a Ramp, or an Elevator or lift. 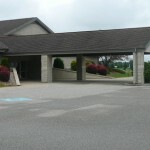 ____ Handrails are provided–on at least one side for shorter ramps and on both sides for rises of more than 6 inches. ____ There is 5 foot level platform at top and bottom of ramp and at any switchbacks. Worship Area Seating. Seating is provided so that a wheelchair user can sit beside family members. Please indicate the number of spaces provided. Note: A space is defined as an area able to accommodate one wheel chair with at least one additional seat by its side. Leadership area. The leadership area (chancel, platform, bimah, minbar) is accessible so that persons with mobility issues can function in leadership roles. ____ Stairs to the leadership area have at least one handrail mounted 34-38 inches above the step. ____ A ramp or lift is provided for wheelchair accessibility (highly recommended) or provision is made for an alternative accessible speaking location for a person in the wheelchair to be seen and heard. ____ A 27 inch table is provided as needed as an alternative to a short podium. Classrooms. At least one classroom is accessible to wheelchair users. Note: All of the criteria are required. ____ An accessible path at least 36 inches wide leads from an accessible entrance to the classroom door. ____ There is a 5 foot level platform at the classroom door. ____ The doorway entrance into the classroom is 36 inches wide with a level threshold of no more than ½ inch. Social/Gathering Area The area where the congregation gathers for social activities is accessible to wheelchair users. All of the criteria are required. ____ An accessible path at least 36 inches wide leads from an accessible entrance to the door of the social/gathering area. ____ There is a 5 foot level platform at the door of the social/gathering area. ____ The doorway entrance into the social/gathering area is 36 inches wide with a level threshold of no more than ½ inch. Additional Recommendations to enhance accessibility are recommended. ____ Accessible telephone. A telephone is provided with the top of the controls no more than 48 inches from the floor and with a knee clearance of 27 inches. 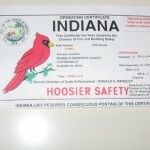 ____ Fire alarms, both visual and auditory are installed 48 inches from the floor. ____ Evacuation plan. An evacuation is in place for persons who are in wheelchairs, are blind, have an intellectual disability or mental illness, or who otherwise need help. ____ Special seating is provided with seat 19 inches from floor, arm rests, foot stool, and extra wide leg room. ____ Fragrance free section. Seating is provided in a separate environment which is kept fragrance free for persons with chemical sensitivities. ____ Bookstands or lapboards are available for persons unable to hold hymnals or scriptures.